I decided to take a break from writing about the MoP Beta and our new minions for a bit. Instead, I’d like to give some “Shout-Outs” to players, bloggers and the podcasting folks I’ve been fortunate to run across in my constant vigil towards promoting the warlock class. As most of you know, I’m an old warlock learning new tricks all the time. If you would have told me six months ago that I’d be blogging about warlocks, making audio segments about them, and meeting so many new friends in the process, I would have wrote you off as nutty. However, such is the destiny that shapes our ends and because of it, I have been very humbled. If you haven’t read Cymre, you should! The Daily Frostwolf, by Navimie – One of my new friends from “Down Under” was recently interviewed on Episode #173 of the Twisted Nether Blogcast called, “The Daily Navizor” and I know she was elated about the interview. Navimie did a great job and I really enjoyed the show. Besides being a devoted WoW player she is also a physician in RL. As much as I enjoy her blogs about WoW, I would love to read more about her RL adventures in Healthcare because she shows that Doctors have feelings too, and they really do care about patients despite how some news stories might portray otherwise. Choosing to devote your life to serving others is heroic and noble. Nice work as always Navimie! I’m not sure how we wound up connecting through twitter (whether he found me or if I found him), but that doesn’t matter to me because I’m glad I got a chance to meet up with Demonicric from Hearthcast on Skype this past Saturday night. We spent nearly three hours chatting away discussing warlocks, MoP, and everything else in between like old friends. Btw, Demonicric…you owe me 3 hours of extra sleep and I apologize for cussing at you the next day for lack of it. Ha! I really did enjoy the comraderie and I won’t hold it against you that you play a gnome! 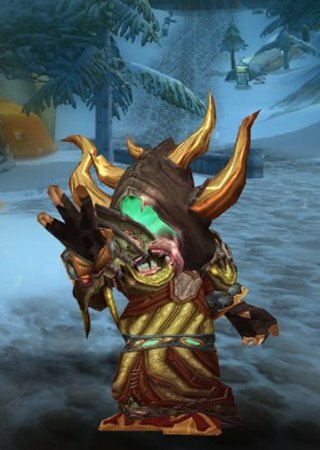 Even though he’s a gnome, Demonicric is rocking out the Tmog by always wearing his helm! 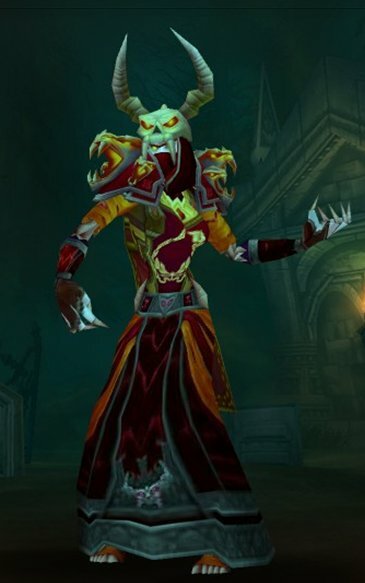 Demonicric is a faithful follower to Demonology and currently raids with that play style in Cataclysm. We even have a running bet trying to guess when the MoP launch will hit. He picked the last week of September, and I picked the first week of October. We shall see my friend, we shall see…and I’ll be in touch! Sanctuary of Shadow, by Alastair – There is a new warlock blogger out there and as you know I’m all about promoting our class as much as possible. I stopped by and read Alastair’s first post and I look forward to many more. This new ‘lock writer is a seasoned WoW player, and is now going back to leveling a long neglected demo warlock alt and plans to raid with that toon in the Mists of Pandaria expansion. His blog is about his adventures while he levels that toon. A new warlock blog? Heck yeah I’ll read! Please take the time and stop by to welcome Alastair when you can. 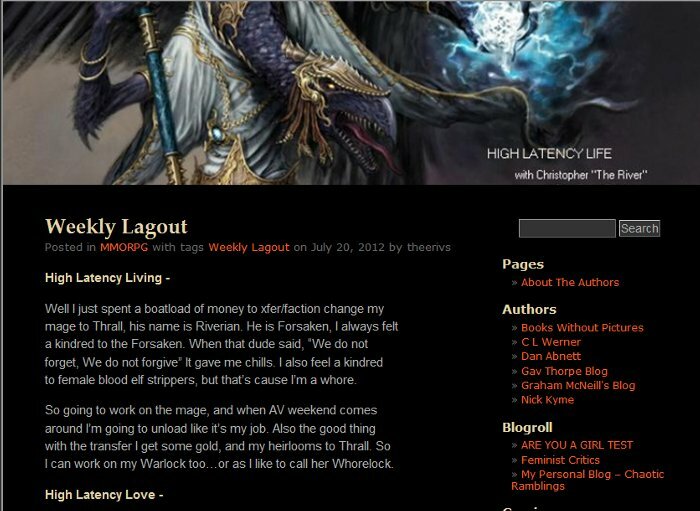 If you know about any other new warlock bloggers out there, please let me know. I’m always looking, but sometimes some sites aren’t so easily found despite your best attempts at the search engines. I love the name he chose and his title pic! 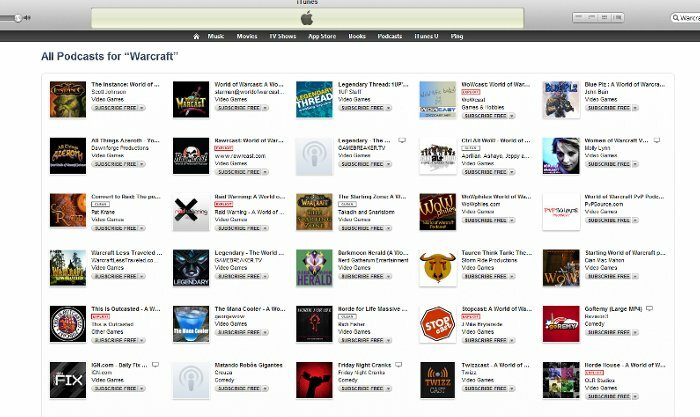 If you’re not listening to some of these new shows…you’re missing out! @Leetawow – If you haven’t heard of Leeta, then you should. She’s what I like to think of as a social media muse for many podcasters, WoW players, and Twitter folk. 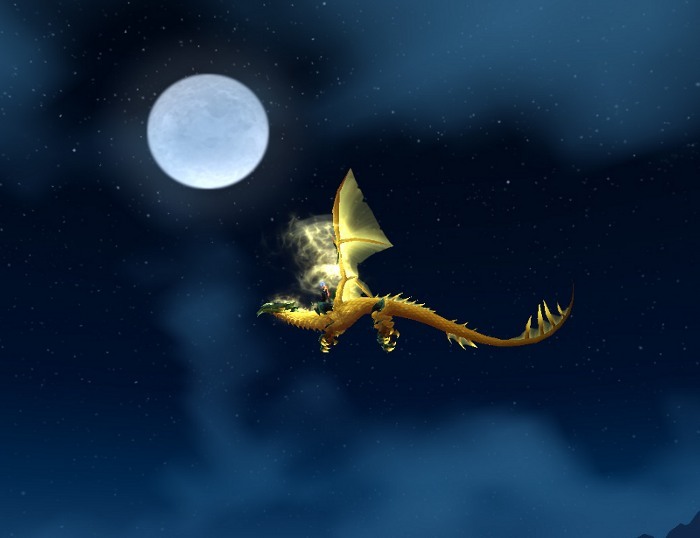 For several podcasts Leeta either sends emails, tweets or voice recordings of what she’s up to in WoW, along with comments, questions, and her own observations. I’ve lost track of how many times I’ve heard a podcast mention one of her emails or call-ins :) She’s a celebrity whether she knows it or not. If you haven’t farmed for this set, trust me when I say that it’s not easy! I think it took roughly 30 runs for me to get the helm to drop! Very nice Leeta! I submit ticket to Blizz and they say it isn’t paid for…huh? I have the receipt? Wtf? I send thanks to @BlizzardCS! Thanks for the pic Saga and I’m so glad you finally got it! Enjoy! A few weeks ago, my oldest decided she wanted to learn how to play WoW. At first, I wasn’t sure what she’d think of it. She’s not into much gaming other than on her phone when she’s trying to ignore her brother in the back of our car. So after showing her the different classes and factions, she settled on a Female Draeni Hunter on one of my old Alliance servers. 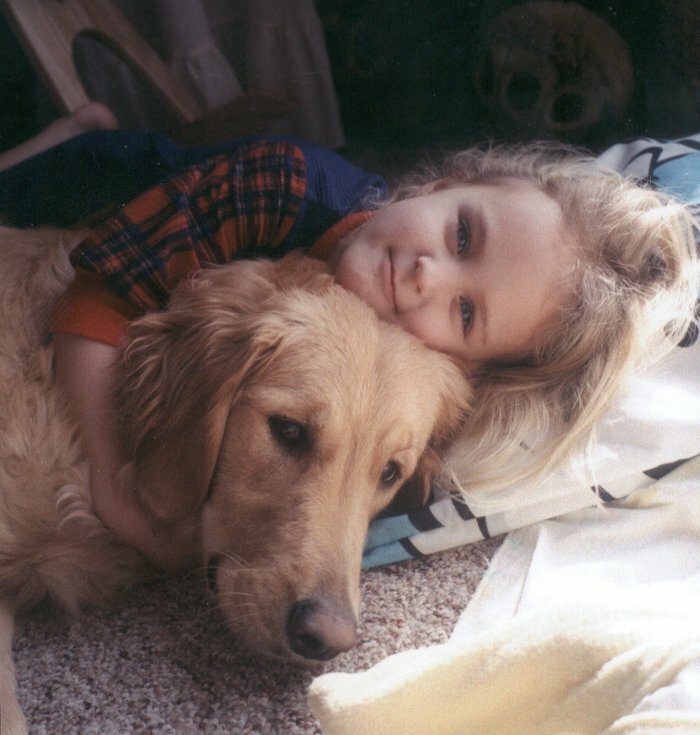 Here’s my little WoW Hunter 12 years ago when she was waking up from a nap with one of our beloved Golden Retrievers. Now she fights me for WoW game time! Well, she’s now level 53 and her noobiness is driving me absolutely crazy! She’s calling and texting me all the time asking me questions about how to do this and how to do that. Any of the gold that was on those old Ally toons is now gone as you can guess. Yep, it didn’t take long for her to “try” these old alts and discover they had gold. :) So, one night I had to show her how to run dailies on an old level 85 toon I don’t play anymore just so she can earn some gold on her own. Until next time, love me or hate me, I send you all my best! Thanks for the lovely kind words Amijade ;) I am immensely humbled and flattered! Everything you write catches my interest and no worries! I try to keep my posts mainly ‘lock centered, but what’s better than talking about a Druid who dreams and writes about warlocks too? Hehe! My best to you and your guildies! You don’t have to thank me, I’m just pointing out all of your hard work in case others haven’t seen – it really is inspiring :P Now, you just need to give me some tips on any rare hunter pets you find in MoP! Great job and please keep up the great work! I think you are feeling way that because of all the pictures of the hawt warlocks Tmog shots such as Saga and Ninevi, not to mention my pics of the Shivarra and Succubus demons I’ve included in my pages too. It’s okay though, that’s their job. They are used to seduce and mesmerize the lower species on the food chain so we can DoT them up and they hit the ground before their drool hits the ground. Now, I will have to reprimand you on the term “Whorelock” with 20 Lashes of Pain. Trust me, it’s okay to turn to the Dark Arts…we have more fun than your magey-friends and we won’t force you to keep your Brony card. Btw, we use the term “Whorelock” for ‘locks who farm only mages in BGs because they are such easy kills. So if you throw that term around with other warlocks they might get confused. However, I’d recommend that you simply tell people your a mage who rolled a ‘lock while you’re playing your new toon so they will instantly understand why you are worthless…er…clueless still learning. Grats and great job on hitting 1,000! Thanks a lot for hosting that contest, and thanks again for the awesome mount! :) I only regret that it ended up being such a hassle for you to get!